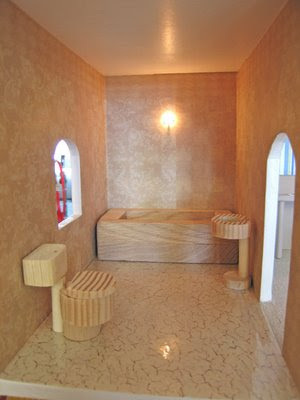 Here is a "before" picture of a wooden doll house toilet, bath tub, and sink. I'm still experimenting, but these are solid and playable. I plan on painting them white. The toilet lid will hinge with a small bit of fabric glued on. You can buy various sized dowels in the craft section of stores, or from a hardware store. I made this picture a little larger than normal so you can see the pieces and how they're put together. As a side note, the wallpaper is scrapbooking paper and the floor is too - it's covered with clear plastic laminate. It is from Joann Fabric and Craft Stores and looks really nice installed. Here is an after picture of the bathroom... First I painted every thing white. The sink part I painted a little bit of an off white to make it stand out more. The toilet flush handle I just painted on with a bit of grey paint. Same with the bathroom sink faucet and handles (I couldn't find anything on hand tiny enough to look realistic, but will keep looking!). The bathtub faucet is a metal hook and the bath tub's hot / cold water handles are earring posts. The pictures on the walls are attached with Velcro so they can be switched around. The pictures are those small ones found on the backs of calendars. Then I glued them on foam paper. The mirror above the sink is a small 1 inch mirror from the craft section, and I glued it to the middle of a piece of foam paper, and then cut small pieces to form a border around it. The toilet I ended up making hinge with a small piece of white duct tape. Here is a picture of a later homemade wooden dollhouse toilet that is a little simpler to make... This lid does not hinge like the other one. 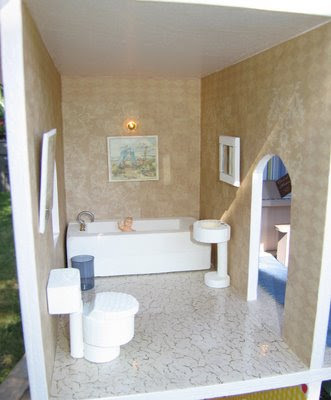 I'm so glad to find a dollhouse site about making things to be played with - not just to look at. I also like the fact that they are made without fancy tools. I did wonder how you cut the hole for the sink and the toilet. Use a large diameter drill bit and drill a shallow hole. It is easiest with a drill press, but can be done VERY carefully with a hand drill. Clamp down the edges of your piece first. This is so simple and nice. You make it so easy. Can't wait to try this out. Thanks! Do you have any size dimensions for the bathroom fixtures? You can adjust them to whatever you think looks good in your particular room... 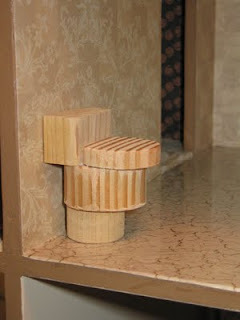 If you are using scrap wood, sometimes that will dictate a certain dimension as well.